Don’t forget to come and visit us this weekend, Saturday 11th & Sunday 12th November 2017 when we will be showcasing our Seasonal Range for Christmas 2017. There are all the favourites from last year plus some new extra special flavours. Don’t worry if you can’t join us though as you can always place an order online at our Christmas 2017 page. Daresbury Dairy’s Chocolate Ice Cream was awarded a 1-star Great Taste award 2017, which means judges dubbed it ‘simply delicious’ for its Chocolate Ice Cream. Made with real Belgium Chocolate, the judges felt it was a ‘Rich, dark and delicious Ice Cream’, which was ‘fresh & creamy’. We are looking forward to the Long Easter Weekend and I am pleased to confirm we will be open Easter Monday in addition to our usual Thursday, Friday, Saturday & Sunday Opening Hours. Come and join us between 12-5pm each day and try out some of our Easter Specials, including Hot Cross Bun, ‘Egg’stravaganza (with Mini Eggs and Cream eggs!) and our Chocomalt flavour. Don’t worry if you missed our Christmas Tasting Weekend, you can pop into the shop any weekend in November (12-5pm) and we can let you have a taste of our exciting new range. There’s lots to choose from: Brandy Cream Ice Cream, Caramelised Fig & Mascarpone Ice Cream or our classic Mince Pie Ice Cream to name just a few. We are also taking orders of our Ice Cream Cakes, Tasting Selection packs and our luxury take home ranges right up until end November (and you can collect the orders just in time for Christmas). Order now online or pop into the shop. Come along to taste our delicious Seasonal Ice Cream & Sorbet flavours and to try our Ice Cream Cakes. Pre-order your favourites ready to collect just before Christmas! 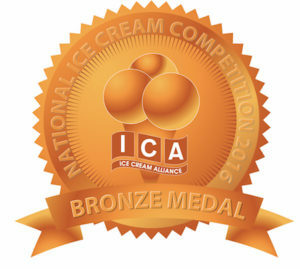 We are delighted to announce that recently our Chocolate Ice Cream won a Bronze Medal in the Chocolate Class at The National Ice Cream Competition, organised by the Ice Cream Alliance. This builds on the success of 2015 where Daresbury Dairy Ice Cream was awarded the Best Newcomer. This was judged on the basis of a blind tasting competition and we are very proud to have been awarded 3rd place. It benchmarks us alongside some of the finest Ice Cream producers in the Country. We have always focused on using the finest ingredients to produce a high quality Ice Cream and we are very pleased we have been recognised for this. Our Chocolate Ice Cream is one of the most popular flavours we sell in our shop. In addition to the Chocolate Award, we also received a Special Diploma for our Chocomalt flavour Ice Cream, and Diplomas for our Peanut Butter Ice Cream and Orange Sorbet.